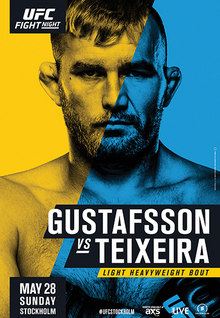 The poster for UFC Fight Night: Gustafsson vs. Teixeira. UFC Fight Night: Gustafsson vs. Teixeira (also known as UFC Fight Night 109) was a mixed martial arts event produced by the Ultimate Fighting Championship held on May 28, 2017, at Ericsson Globe in Stockholm, Sweden. Preliminary reports indicated that the event was expected to be contested at the newly opened Royal Arena in Copenhagen, which would have marked the promotion's first visit to Denmark. However, on February 28, the promotion announced that the event would take place in Stockholm. A light heavyweight bout between former UFC Light Heavyweight Championship challengers Alexander Gustafsson and Glover Teixeira served as the main event. The pairing was previously scheduled to headline UFC Fight Night 69 in June 2015. However, Gustafsson pulled out of that fight due to injury. Magnus Cedenblad was expected to face Chris Camozzi at the event. However, Cedenblad was removed from the card on March 27 and was replaced by Trevor Smith. Emil Weber Meek was expected to face Nordine Taleb at the event. However, Meek pulled out of the fight on May 12 citing injury. He was replaced by promotional newcomer Oliver Enkamp. A heavyweight bout between Christian Colombo and Damian Grabowski was expected to take place at the event. However, the pairing was scrapped as both fighters sustained injuries in the weeks leading up to the event. Mairbek Taisumov was expected to face Joaquim Silva at the event. However, Taisumov pulled out of the fight on May 16 citing a knee injury. He was replaced by Reza Madadi. At the weigh-ins, Darren Till came in at 176 lbs, five pounds over the welterweight limit of 171 lbs. As a result, he was fined 20% of his purse, which went to his opponent Jessin Ayari and the bout proceeded at a catchweight. ^ a b Staff (2017-05-28). "UFC Fight Night 109 attendance: Stockholm draws another solid crowd". mmajunkie.com. Retrieved 2017-05-28. ^ a b Staff (2017-02-28). "Alexander Gustafsson vs. Glover Teixeira headlines UFC Fight Night in Stockholm". mmajunkie.com. Retrieved 2017-02-28. ^ Dale Jordan (2017-01-28). "UFC to make promotional debut in Copenhagen, Denmark on May 27, 2017". mmamad.com. Retrieved 2017-01-28. ^ Staff (2017-02-28). "Gustafsson vs. Teixeira set for UFC return to Stockholm". ufc.com. Retrieved 2017-02-28. ^ Staff (2015-05-01). "Gustafsson out vs. Teixeira, Jedrzejczyk vs. Penne headlines UFC Fight Night 69". mmajunkie.com. Retrieved 2015-05-01. ^ Staff (2017-05-12). "Emil Meek says he's out of UFC Fight Night 109 fight with Nordine Taleb in Sweden". mmajunkie.com. Retrieved 2017-05-12. ^ Staff (2017-05-16). "Injuries scrap Christian Colombo vs. Damian Grabowski at UFC Fight Night 109 in Sweden". mmajunkie.com. Retrieved 2017-05-16. ^ Staff (2017-05-19). "Reza Madadi steps in for Mairbek Taisumov, meets Joaquim Silva at UFC Fight Night 109 in Sweden". mmajunkie.com. Retrieved 2017-05-19. ^ Staff (2017-05-27). "UFC Fight Night 109 official weigh-in results: Gustafsson, Teixeira cleared for headliner". mmajunkie.com. Retrieved 2017-05-27. ^ "UFC Fight Night: Gustafsson vs. Teixeira". Ultimate Fighting Championship. Retrieved 2017-02-08. ^ Staff (2017-05-28). "UFC Fight Night 109 bonuses: Main event nabs 'Fight of the Night' honors". mmajunkie.com. Retrieved 2017-05-28.